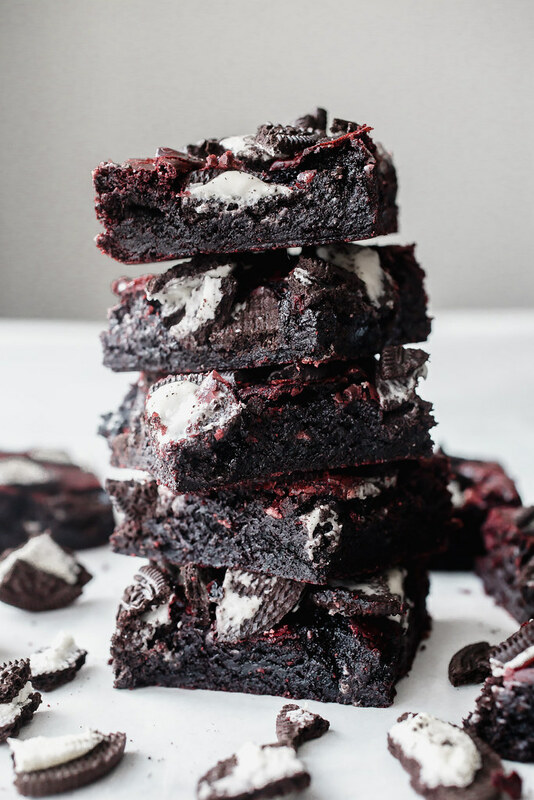 Red Velvet Oreo Brownies: Chewy and fudgy red velvet brownies chocked full of Oreos. 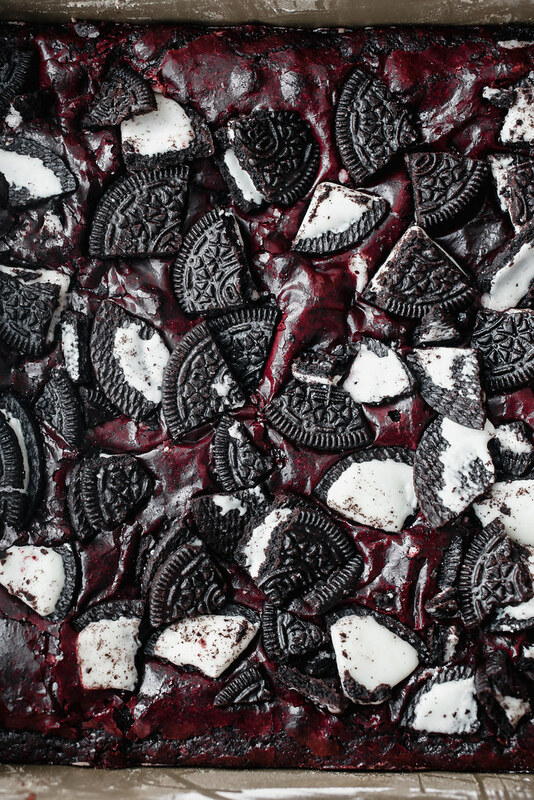 These are an Oreo lover’s dream come true! Ages and ages ago, I made red velvet brownies with white chocolate buttercream frosting. Let me tell you! Those brownies circled the internet like wildfire! They have been Pinned more than 780,000 times on Pinterest and have hundreds of reviews here on the site! 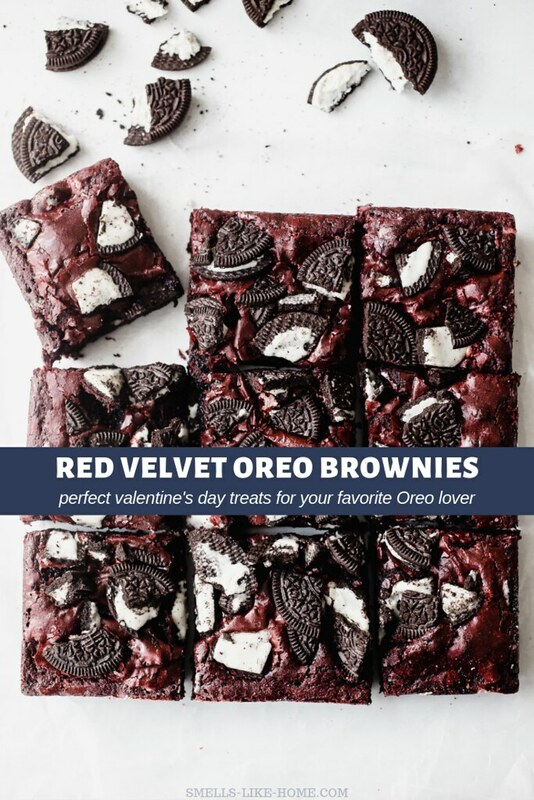 Those brownies, like many red velvet recipes, have become iconic Valentine’s Day treats so instead of oversaturating the internet with another cupcake recipe, I thought I’d make these red velvet oreo brownies instead! I mean, guys! They’re brownies! With Oreos! Much like my beloved outrageous Oreo brownies from years and years ago, these are also chocked full of cookies. 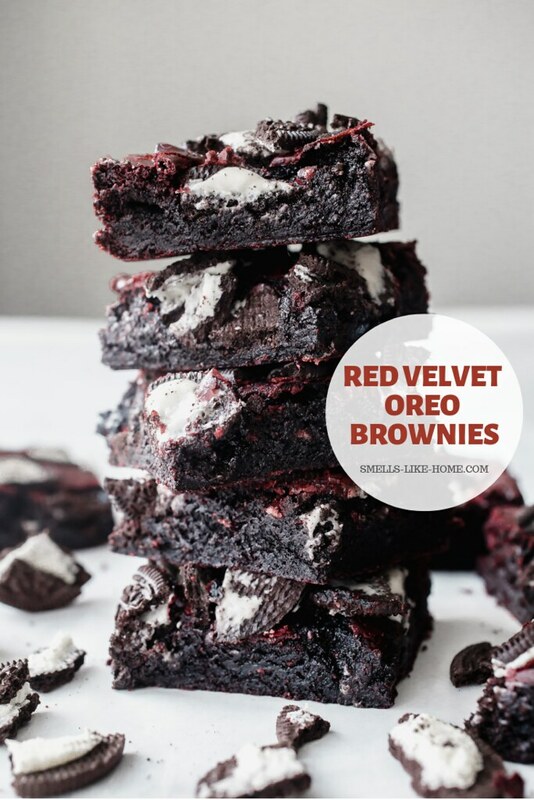 And yes, I realized that I DID just recently make other brownies with Oreos but these red velvet brownies are more of a year-round brownie, rather than being relegated to the Christmas season due to the peppermint flavor. 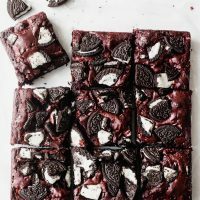 And frankly, these red velvet Oreo brownies are easier to make, using WAY less bowls than those peppermint Oreo truffle brownies required. Less in the clean-up department is always a win for me. Are you with me?? Actually, you’ll only need 2 bowls for this recipe. One large one to mix up the batter. And one small bowl to mix up the cocoa-food coloring-vanilla paste. The paste in this recipe is kind of a genius thing! 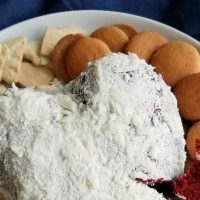 Normally, baking with food coloring – especially liquid vs. gel food coloring, like in this recipe – is a messy prospect. Aside from routinely getting the food coloring all over my hands, I’ve also witnessed liquid batter splashing out of the bowl, leaving food-colored batter globs all over the counter and backsplash. And by “witnessed,” I mean that I was the one running the mixer. Anywhoooo! The cocoa in the paste absorbs the food coloring and this prevents a big ol’ giant colored mess when you mix it into the batter. Because the paste is almost the same consistency as the batter, this allows the 2 mixtures to seamlessly combine together. No mess!! With over 250 reviews that readers left on my original red velvet brownies post, 1 issue about those brownies was pointed out by a few people: the brownies totally sunk in the center. Mine did too. Come to think of it, many of my brownie and bar recipes tend to sink in the center. I don’t usually mind this too much since a brownie is a brownie, right? But when you’re going for a beautiful presentation, towering crunchy edges and sunken fudgy center brownies aren’t always the prettiest. So I did a little research into this sunken brownie issue. And what I’ve come up with is that the likely contributor to this issue is too much air in the batter. This happens when you beat the batter for too long, even before you add the flour. This time around I was more careful. I beat the butter and sugar up pretty good since my butter wasn’t quite room temperature when I started. And then I didn’t over beat the eggs but made sure they were completely incorporated without beating too much air into the batter. I think this is the point where the batter can be most easily over beaten. So long as the eggs aren’t visible in the batter, you can stop beating! You’ll add the cocoa paste next and you will only need to mix this in until the batter is one uniform color. Scrape down the sides and bottom of the bowl and mix really quickly again, just to make sure there’s no thick, yellow butter patches hiding in there. If you take these steps to not over beat your batter and ensure that they are fully baked, you will not end up with sunken-center brownies. Promise! If you’ve been around SLH for long enough, you’ll know that one of my mantras is to cook and bake with as few processed ingredients as possible. I mean, I’ve made my own chocolate wafer cookies for capppucino fudge cheesecake. I make wheat thins. Flour and corn tortillas. Hot fudge sauce and peanut butter magic shell for our ice cream. Heck, I’ve even made my own Oreos! But when it comes to adding cookies to a recipe, you just cannot beat the taste of the real-deal Oreo cookies. I make exceptions for Oreos. And it’s more than the flavor too; it’s also the texture and consistency. 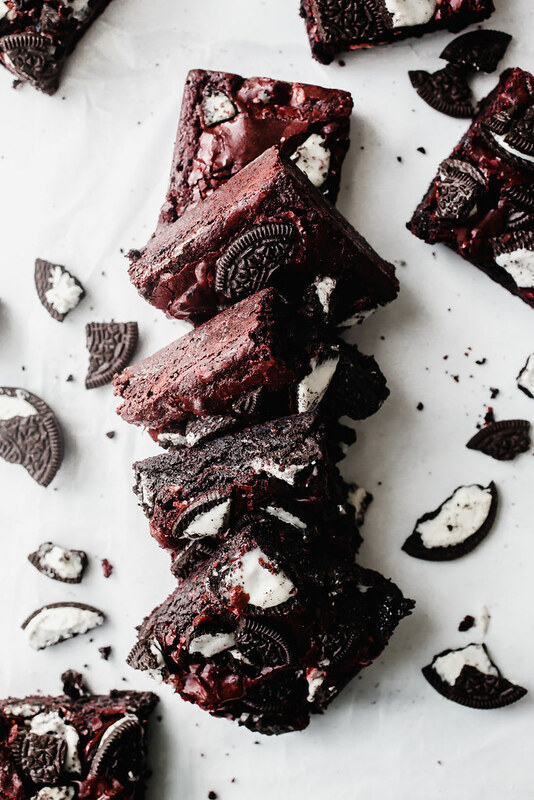 Whether they are chopped up and baked atop these red velvet brownies or crushed up into crumbs for a crust for peanut butter pie, Oreo cheesecake bites, or a chocolate cream pie, Oreos sometimes just make a recipe! And by no means is this post sponsored by Oreos or Nabisco, I’m just lamenting here. Anyway! We loved this version of these brownies just as much as we loved the original version. 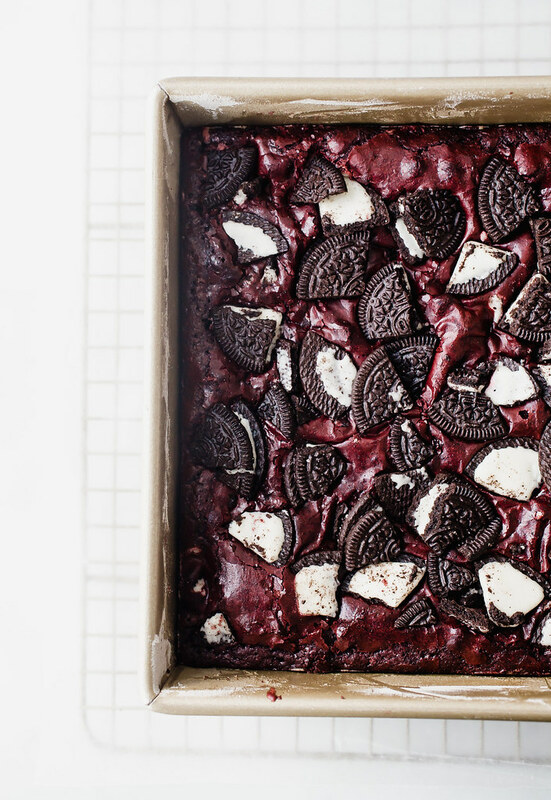 They’re big, chewy, fudgy brownies that are just completely chocked full of Oreos. Go and make them today for yourself or for the Oreo lover in your life and totally make their day! Looking for more Red Velvet Inspiration? 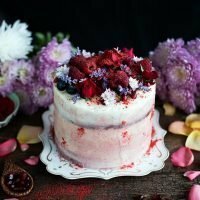 If you're looking for more red velvet ideas, here are some recipes from my blogging pals. 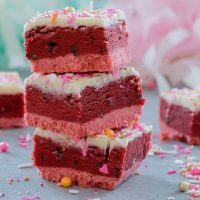 Perfect for showing your love this Valentine’s Day, these no-bake Red Velvet Cookie Dough Bars are composed of a pink cookie crust, a luscious layer of chocolate chip red velvet cookie dough, and a white chocolate ganache topping. And don’t forget the sprinkles! 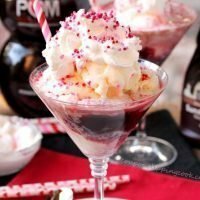 Red velvet ice cream floats made without red food coloring! Can you guess the secret ingredient? 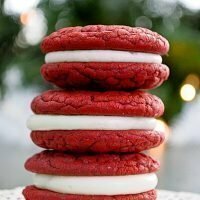 Soft, chewy red velvet cookies with cream cheese frosting! The perfect sweet and tangy combo. So pretty and festive, perfect for Christmas or Valentine’s Day! These brownies are an Oreo lover's dream come true! 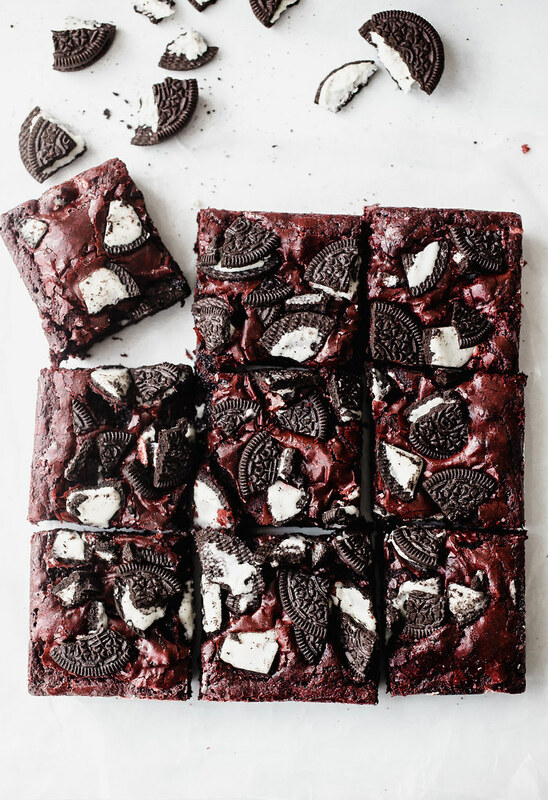 They're chewy and fudgy red velvet brownies chocked full of Oreos. YUM!! 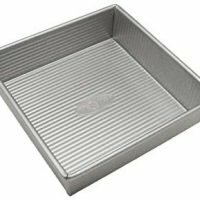 Preheat the oven to 350° F. Butter and flour an 8×8-inch baking pan. In a small bowl, slowly stir together the cocoa powder, food coloring, and 1 tsp vanilla into a thick paste until no lumps of cocoa remain. Set aside. 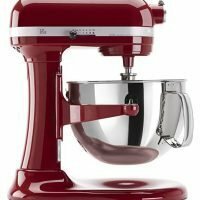 In the bowl of a stand mixer fitted with the paddle attachment, beat together the butter and sugar on medium speed until light and fluffy, about 2 minutes. Add eggs one at a time, mixing well after each addition but only until they just completely incorporate, then stir in the remaining 1 tsp of vanilla. With the mixer off, add in the cocoa paste, then turn the mixer to medium and beat the two mixtures together just until they are one uniform color. This should only take about 10 seconds or less. Add in the flour and salt and mix on medium-low speed, just until combined. Do not overmix. Remove the bowl from the mixer and stir up the batter with a rubber spatula once or twice just to ensure all of the flour has incorporated from the sides and bottom of the bowl. 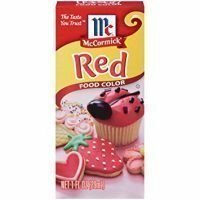 You'll want one uniformly colored (red) batter. Fold half of the chopped Oreos into the batter with just a couple of gentle stirs. Transfer the batter into the prepared pan and cover the top of the batter with the remaining chopped Oreos. Bake for 30-40 minutes or until a toothpick comes out with just a few crumbs clinging to it when inserted into the center of the brownies. Darker pans will need to bake at the lower end of this range to avoid overbaking. Allow brownies to completely cool in the pan on a baking rack, about 45-60 minutes. Cut and serve. These brownies are darker than my original red velvet brownies because I used black cocoa powder. I had no other unsweetened and non-dutch processed cocoa in the house when I decided to make them so they don't have that vibrant, bright red hue that you normally associate with red velvet. And I kind of like it!